TGIF, dear readers! I've got a quick post to share this morning so I'm going to jump right on in! 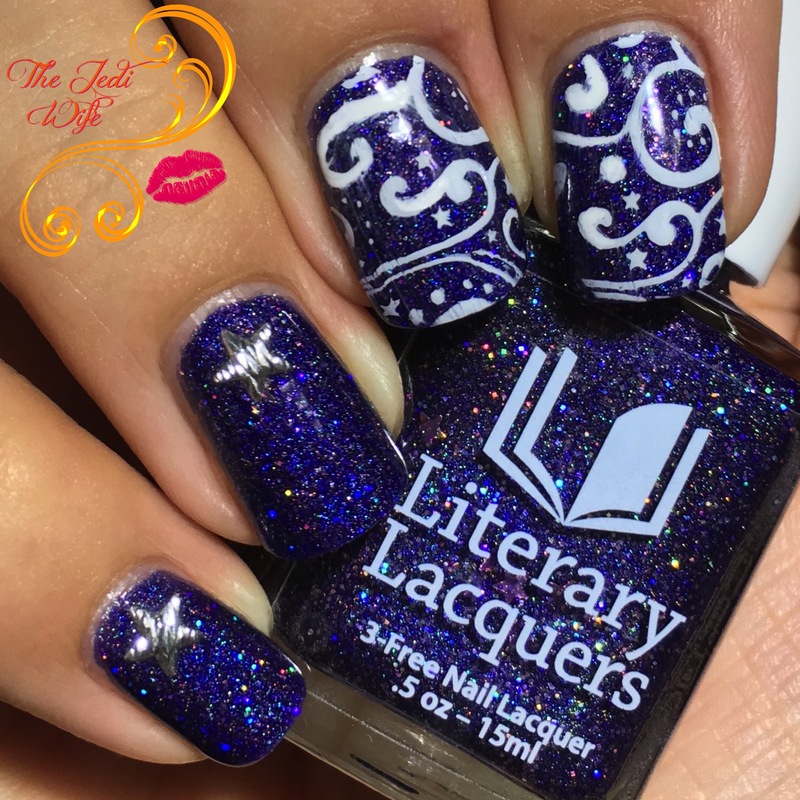 In a previous post, I shared Visions of Sugarplums, the gorgeous gift with purchase by Literary Lacquers. This polish is stunning and just begged to be used in a nail art design! I wanted to keep the design simple so as to not detract from this magnificent polish. I knew I wanted to do a little stamping used this lovely swirled design from the Ejiubas EJB-03 stamping plate. I used Rica's Whiteout for the stamping. The stamped image covered the polish a little more than I wanted so I altered my design some and decided to just add these star studded accents on my last two nails. I'm pretty happy with the final look, and I'm glad I made the modification mid-stamping! The star accents really let me enjoy this beautiful polish! 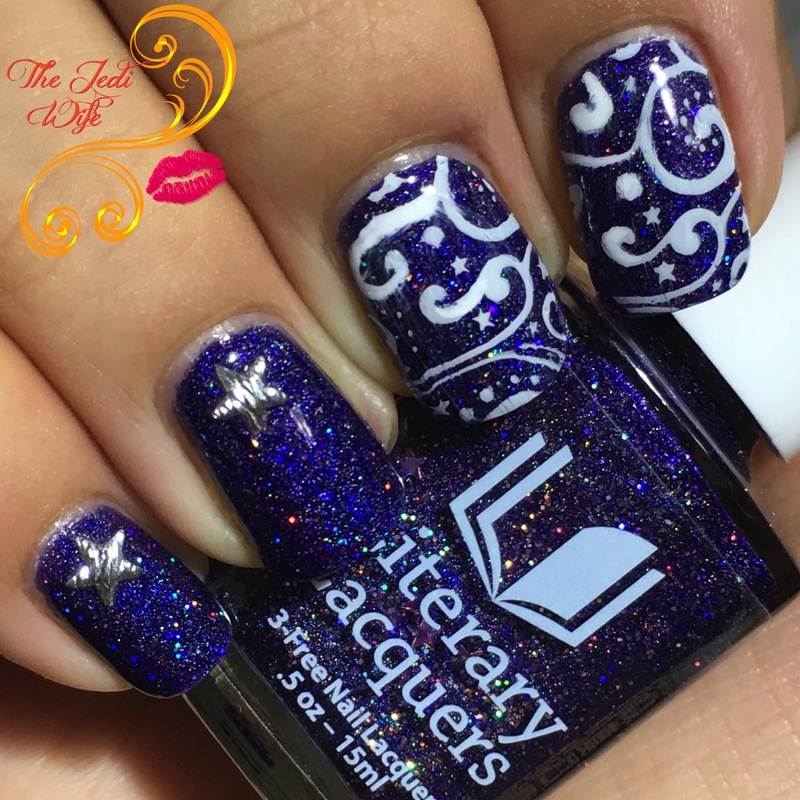 There is still time to get this beautiful gift with purchase from Literary Lacquers! For every purchase of $24, you will receive a mini-sized bottle of this beauty, and a purchase of $48 or more will come with a full-sized bottle. This will only be available until the store's temporary closing January 2nd so be sure to get an order in today/this weekend! Discount code HOLIDAY2016 will also save you 20% off your order and is also available until the store's close. What do you think of this design? Do you like the added star accents to go with the hidden stars in the base polish? The base polish is killer, you nailed it. LOVE the design - super stunning mani! And so many gorgeous favorites from you!! I love the design! That polish is gorgeous and I think it was a great idea to only add the stars to the last 2 nails. That polish is so gorgeous!